Cabel Sasser and the team over at Panic have been working hard lately on a lot of their products, and the recent debut of Status Board 2 for iPad (free with in-app purchases) made it obvious that their hard work is paying off. Status Board is a unique iPad app — users basically add status panels to a full-screen iPad display that show those things they’re interested in seeing all the time. Things like the time (local or in other cities), weather, upcoming appointments, incoming mail subjects, tweets, or headlines from news feeds. Using bright, bold colors to display the information, Status Board 2 makes it easy for just about anyone to set up and customize their very own status board. The panels can be moved around with a simple drag and drop, and an iPad can have multiple status boards set up for auto-rotation. For companies that might want to have similar Status Boards in widely separated offices, it’s possible to publish boards that others can subscribe to, and the subscribers stay up to date automatically. Owners of Status Board 1 get the expansion pack in-app purchase for free. I found Status Board 2 to be stable, fast (even on an iPad 3), and ridiculously simple to use. From installation to getting a fully-functional simple status display with time, weather, a calendar showing upcoming appointments in two formats (list and ticker) took me only about three minutes. 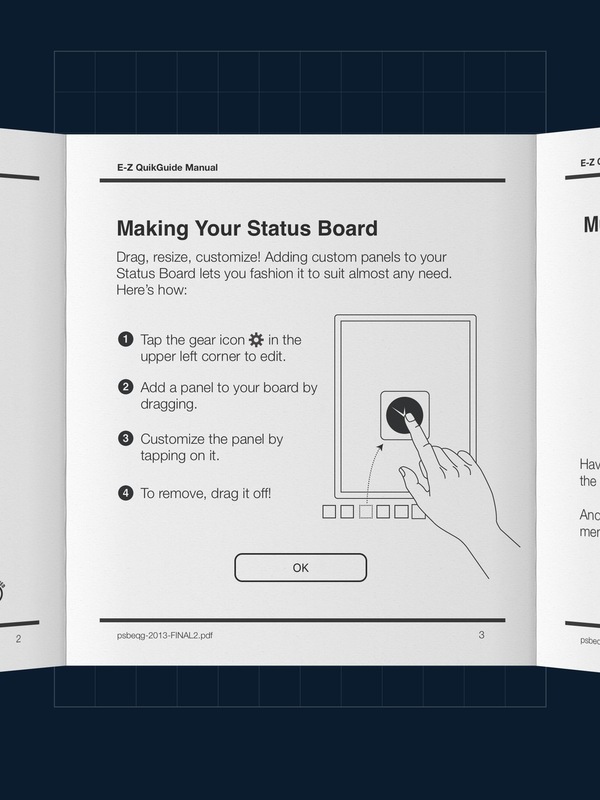 To learn how to use Status Board, Panic throws in a tongue-in-cheek fold out “E-Z QuikGuide Manual” complete with cheesy lounge music in the background (see gallery below). It’s not often that a user guide makes me laugh, but this one did. One other feature of Status Board 2 that is very cool is that with the proper adapter, it’s possible to connect the iPad to a large-screen display. So if Status Board 2 is being used to give your employees in a call center up-to-the-second information, you can blast it to them on a 60-inch HDTV. Booyah! I love Panic’s freemium model with Status Board 2. For people who just want many of the common items on their Status Board, the app is free to try out. If, like most users, they suddenly realize the potential of a status board for business or home, they can spend the extra ten bucks to get additional functionality. Status Board 2 is truly one-of-a-kind and combines ease of use with incredible potential for anyone who needs a constant display of information. Highly recommended.